Wireless charging of portable devices does much more than just getting rid of the cables, explains Meng He, executive business manager, Maxim Integrated. Pike Research has forecast that mobile devices will grow from 3.74million in 2012 to 27.63million in 2016. Smartphone manufacturers began integrating wireless charging in smartphones in 2013. Wireless charging in mobile devices is expected to become as ubiquitous as WiFi and Bluetooth. In June 2015, the Alliance for Wireless Power (A4WP) and the Power Matters Alliance (PMA) merged, creating the AirFuel Alliance. The merger accelerated a vision that wherever a consumer goes, device charging will be interoperable and convenient. Various technologies are being tried. Near-field, or magnetic resonance, charging was first demonstrated by Nikola Tesla in the 1890s. It involves the transfer of energy via an oscillating magnetic field (Figure 1). The current and voltage transferred from the transmitter to the receiver must be AC. Today, a charging mat is the transmitter and is plugged into a wall outlet. This AC line voltage is stepped down and converted to DC to bias the transmitter’s driver and controller circuitry. The drivers and controllers generate and regulate the switching frequency to convert the DC back into AC that feeds into the primary-side coil. On the receiver side, the AC is rectified, then adjusted through synchronous conversion and used to charge the battery. The frequency in the coil changes, based on the amount of power needed by the receiver. A communication signal is superimposed onto the power signal so that both know that a device has been placed on the charging mat. Inductive charging is efficient but is highly sensitive to coil misalignment. The coupled coils need to be tuned slightly off-resonance frequency for optimal power transfer. 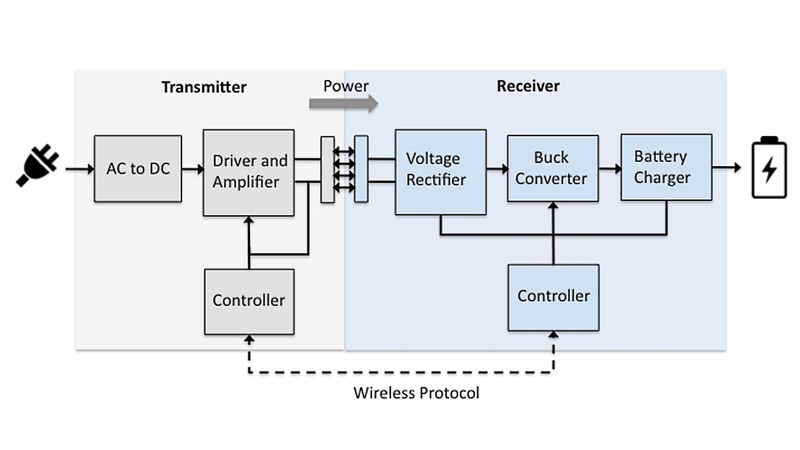 Figure 2 shows a near-field inductive charging system. One inductive charging standard is Qi, developed by the Wireless Power Consortium (WPC), which includes over 200 companies. AirFuel Inductive is another standard. Powermat is an example of a bridge technology that offers a universal ring to engage with the charging mat and charge the portable device. Resonant charging with distance is the other form of near-field charging. It uses the same electromagnetic field principle, but requires a resonator front end. This standard is governed by AirFuel Resonant and allows for a short air distance between the transmitter and the receiver. A single 6.78 MHz transmitter can support multiple receivers without physical alignment. Precise frequency matching is required between the receiver and transmitter to maximise the power transfer distance and the coil size. Transferred power decreases with more connected devices and distance. A separate bi-directional communication (Bluetooth) channel between the transmitter and each receiver is required. An example of a near-field resonant charging system is shown in Figure 3. Because of the two standards, General Motors (GM) announced its vehicles will support both AirFuel Inductive and Qi. Samsung also decided that their phones should support both standards. 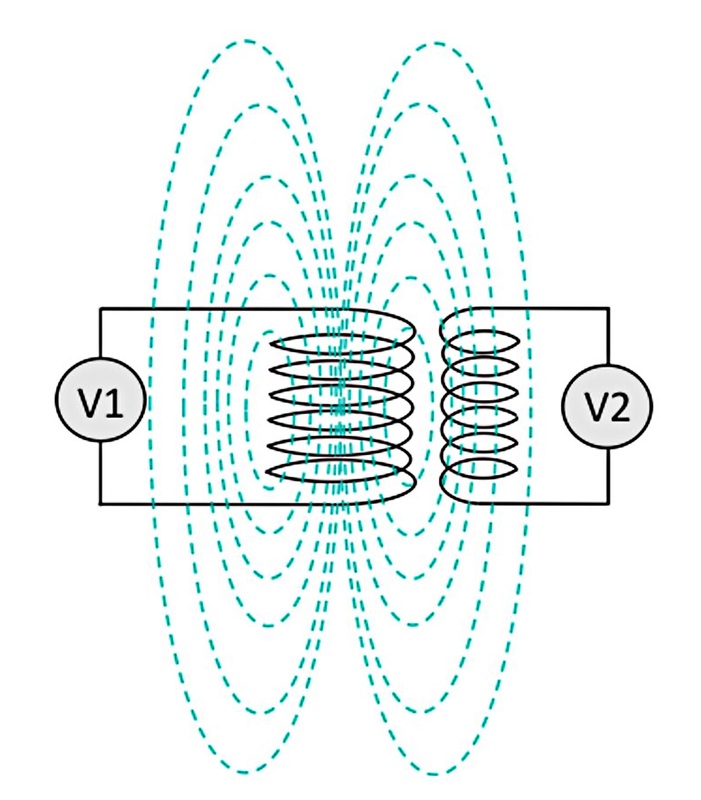 Both inductive and resonant charging require a minimal distance between the transmitter and receiver. In far-field charging the energy is beamed from an energy hub to specific devices. Bluetooth, WiFi, ultrasound, and infra red (IR) have all been explored. An RF-based system (e.g. WattUp) uses one or multiple antennae to broadcast energy and communication. In October 2015, Energous announced the availability of the first RF-power receiver IC, which rectifies RF to DC signals. The integration enables the charging technology to be embedded into portable devices. A new technology, Cota, uses the existing WiFi and Bluetooth antennae to perform double-duty, as both data and wireless power receivers. These micro signals then add up to a charging current for the batteries. The presence of the receiving device along with the specific battery charging profile data is communicated back to the power router wirelessly. Once a continuous link is established, the power router will then transmit energy beams to the location of the receiver. In an ultrasound system, represented by uBeam, a signal generator in the router generates an electrical signal that is sent to an amplifier. The amplified signal is fed to a transducer to generate ultrasonic waves that are focused and sent to a receiver. An ultrasound wave stresses a piezoelectric transducer resulting in a charging current. The transducers used on both sides of the system need to be efficient and capable of high power. Another startup, Wi-Charge, focuses on transforming line-of-sight light to energy. The transmitter precisely beams IR to the receiver using a laser diode. A photovoltaic cell in the receiver then converts the light back into electricity. A functioning demo of the system was shown in San Francisco in February 2015. One obvious advantage of the IR technology is that it is EMI radiation-free. The ability to locate and follow multiple moving receivers is critical. The relative position between the transmitter and receiver in near-field charging do not change, but in far-field charging, the user might be constantly moving. Users should be able to roam without losing coverage. Radio frequency (RF) safety is determined by how much exposure can be applied without harm to human health. The specific absorption rate (SAR) is used to define these limits. Safety for consumer products is more than passing safety agency regulations; it is about establishing consumers’ perceived safety. There is no room for a single bad user experience. Safety for ultrasound might be a concern for consumers. One concern is whether ultrasound impacts animals. Operating at higher frequencies that even animals are not sensitive to might solve this problem. Wireless charging systems are based on high frequency switching signals and must anticipate noise sources, both in and outside of the charging system. Two elements to consider are the cost of the power and transfer efficiency. Can a wireless charger charge the battery of a completely depleted device? “Simple is hard. Easy is harder. Invisible is hardest,” said Jean-Louis Gassée, former Apple Computer executive. The far-field charging system faces a problem that does not exist for the near-field: the control circuit on the receiving side needs power to be linked to the power router. The vision of a world with mobile devices that are never out of power is achievable, but the path to it is paved with collaboration between multiple entities. According to IHS in 2014, 70% of consumers charge at least one device once a day. Not only should devices support wireless charging technology, but there should be plenty of hotspots for them to be charged. The adoption will come to full fruition once the base infrastructure is in place. It has been over 100 years since Nikola Tesla first transmitted electricity, but we are still far from unleashing the full potential of energy conversion. Our electronic devices need to become smart enough to charge themselves.